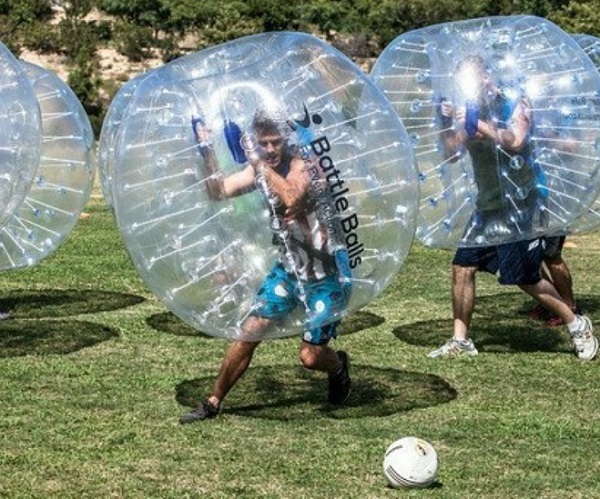 These Battle Balls are designed for playing Bubble Soccer or just goofing around. Bubble Soccer is an upcoming sport based on the traditional game of soccer with an added twist. Each player dresses up in the battle ball and is allowed to bounce off of other players while chasing after the soccer ball. Put on a Battle Ball and bash into your friends with this new fun and amusing physical activity. Bubble Soccer is becoming a recreational sport that is taking the industry by storm. Each Battle Ball is constructed from 0.8mm Clear Plastic PVC. Safe both both adults and children, the Battle Ball is light-weight and suitable for a number of surfaces from AstroTurf, outdoor grass, and indoor gyms.